Currently we have a huge backlog of around 3,500+ memorials to put on-line and between 20,000-30,000 edits to existing memorials. This is a voluntarily run website and we are currently inundated due to the start of the centenary events marking the start of World War 1. Although we do try to reply to emails the volume is such that we cannot guarantee a response, sorry but there is a huge amount of emails coming in and it is just not possible. Photographs from various periods of the local memorials for Cambridgeshire can be found on the Cambridgeshire Community Archives Network website. Throughout Cambridgeshire there are various memorials and rolls of honour dedicated to those men and women who fell in various wars. These memorials and rolls cover many centuries in some cases, most World War One and Two. During any conflict there are certain acts of bravery or defiance that are noticeable above others. For these acts citations and medals have been awarded. There is a list of some of the Cambridgeshire people who have carried out such acts and the award or citation given. Cambridgeshire is home to the one bruial area in the United Kingdom for American Service men who died in World War 2; the Cambridge American Cemetery at Madingley. 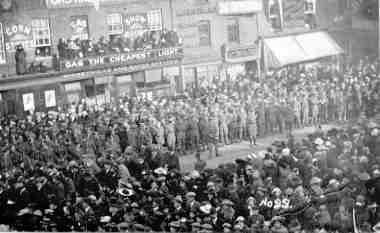 These pages are available for transcripts of these memorials and rolls of honour. If you have a transcription of, or you are willing to transcribe, a Cambridgeshire memorial or roll of honour for these pages then please contact me, the email address is below. Current acknowledgements for assistance with these pages must go to Cliff Brown, Phil Curme, Dave Edwards, Lynda Smith, Joanne Robb, Ann McClean, Marlene Williamson and Fiona Davis - thank you all. This site is maintained solely by volunteers and is funded by them as private individuals. This includes the purchase of photographs, books, rolls of honour plus the running costs of the site. We have always intended to make this site free to all. If you have gained from this site then please consider making a donation through PayPal by clicking on the donation button. Thank you. 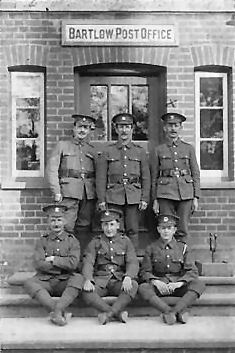 The Suffolk Regiment during World War 1 contained many men from Cambridgeshire and the Isle of Ely. A FAQ covering the 11th Battalion, the Suffolk Regiment and a detailed piece about the Battalion's ill conceived attack on the Roeux Chemical Works during the Arras offensive in April 1917, the latter includes a map supplement, can be found on Phil Curme's website. Safe in England once again! Lift your heads then! Tune your voices! Make the hills and dales to ring! As they chant the victor's hymn? Often heard shall never tire. 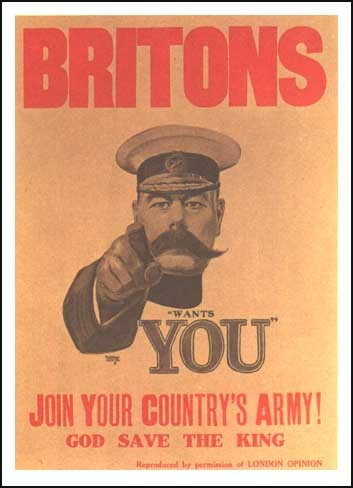 For those of you with an interest in the World War 1 there is The British Army in the Great War, World War 1 - Trenches on the Web, the Regimental Warpath and the Cambridgeshire branch of the Western Front Association. Cliff Brown, Dave Edwards and Phil Cume have generously added detail to the names recorded for many of these memorials giving details of those who died. These names are all taken from the main local war memorial (i.e. the town or village memorial). Some extra names are added on the end when they crop up elsewhere in the town/village, such as someone buried in the cemetery. For further reading when researching World War 1 relatives then there is a book published by the Federation of Family History Societies for family Historians entitled "World War I Army Ancestry - Third Edition" by Norman Holding ISBN 1 86006 056 2. Soldiers outside Bartlow Post Office during World War 1. The War Memorial Trust is a charity dedicated to promoting awareness of the debt we owe to those who gave their lives in the cause of freedom, by ensuring that their memorials are properly maintained and preserved. 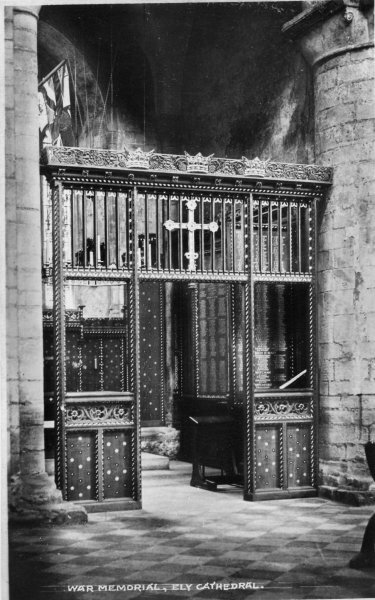 This section contains various news reports and cuttings, old and new, with reference to the memorials in and around Cambridgeshire. To view the section please click here. The various memorials and cemeteries maintained by the War Graves Commission for the Western Front are described and pictured on the Internet. There is also another site that describes these memorials. Details of Kranji War Cemetery can be found on MyFarEast website. Some military memorials cover the period from World War 2 to present these include Bassingbourn.